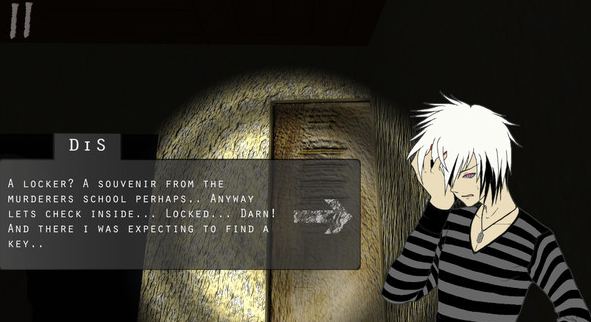 "Disillusions Manga Horror" is a horror adventure PC game that has you playing as a guy with white hair and a striped top, he is named Dis. Dis got a message from his friend saying to meet him in a house where a supposed serial killer used to live. Dis' friend also wants so to go exploring to see if they can find anything good. Dis takes a trip to the house and notices how spooky it is and thus it is your goal to look around the house to find your friend. 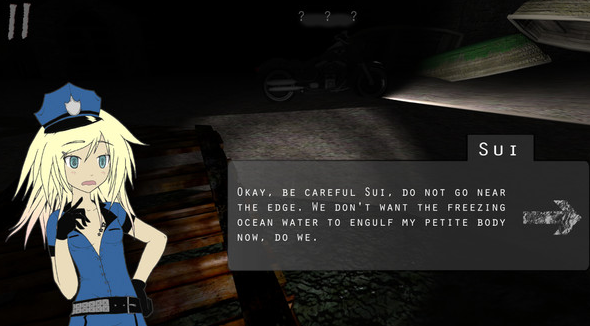 Later in the game you are introduced to a female police officer named Sui who looks a little bit like a stripper cop (not saying that's a bad thing). Sui is on duty and is looking around a spooky site that just happened to be a place where a guy went crazy, killed a bunch of people, and blew up stuff. Sui also happens to notice that she is not alone and thus she has to search around to find the mysterious person before the mysterious person finds her. Could both Dis and Sui's stories be linked? (Click "Read More" to read the full review). The story in this game showed some promise at the start but then it quickly spiraled down into a bland and uninteresting story. The story gets worse as it goes along and then you hit the ending which just seemed tacked on and didn't know what it wanted to be as one minute this is a standard horror, another minute it is trying way too hard be a creepy pasta. The horror in this game isn't very good as it relies on cheap jump scares that are more laughable than scary. Characters in this game started off okay but there really wasn't anything much about them as most of the things they say are just reactions to the cheap jump scares and so they lacked depth. Gameplay is very simple as all you are doing is walking around and interacting with certain parts of the level. You'll know which parts to interact with as you will see a box that says "???" in clean white text. You beat a stage by interacting with all of the key events but that doesn't mean that you have to interact with every event, it doesn't hurt to do so though. You will know when a key event is happening as they stand out over all the other events, that's a good thing you can tell the differences without the game telling you. The problem I have with the events is that most of them do not give me a reason to fear anything, the events are mostly harmless with the exception of one. The one exception didn't have anything to do with any of the characters but more to do with fragile platforms. You also earn points from activating the events and you also have a star ranking system for each stage. The goal is to beat each level with a three star rating and so this game does have replay value. This game is very short as it only has three story driven levels, you can beat the game as a whole in less than twenty minutes (might have to make a let's play one of these days). There is a bonus fourth chapter that plays much different than all the other levels. What is so different about the fourth level? 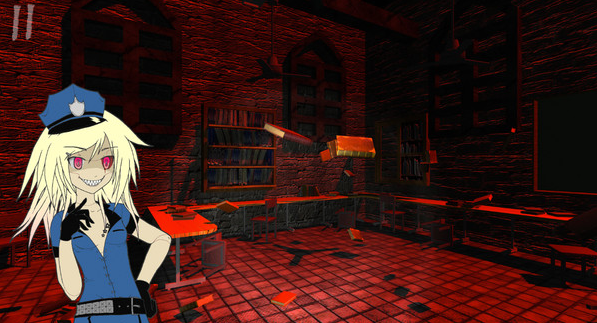 The fourth level introduces multiplayer and the goal is to scare the other players by setting dastardly traps. When I mean you have to scare the other players, I really do mean you have to literally scare the other players (the actual people and not the game characters). The way you do it is by placing spooky traps that activate when a player is near them and thus creating cheap jump scares for the other players. I like the concept and it is unique but the problem is that this game is not scary. A huge problem is that you can see the traps coming a mile away due to how cramp the levels are. There will be sometimes though where the other player will sneak in a well placed trap but that is quite rare. One thing I liked about how this mode is played is due to all players being invisible with the exception of their bloody footprints, it defiantly works with the horror theme. The new stage added for the multiplayer level is nothing but dark corridors and as I said before, it was cramp. One thing I did like about it was that one of the traps gave some unexpected detailing to the story and makes up for some of the lackluster storytelling as it patches up some holes that the story left. Another neat thing is that you don't just have to solely play the new level in multiplayer mode as you can play the first three stages as well. It does feel a little weird that this mode was marked as a fourth chapter instead of just being marked as a bonus mode. Another problem I had is that barely anyone was playing this online and if you want to play online, I recommend you just get your friends to join in instead of hoping some random person will be roaming the servers. Speaking of online, it ran very well as it wasn't laggy at all and that's saying something as I have a very cruddy Internet connection. A huge props to fellow TNR co-worker, Six Health of Fury for helping me explore the online multiplayer. Controls in this game are very simple as all you are doing is using the W,A,S,D keys to walk around and moving the mouse around to control the camera. There is a button you can hit to make the characters run but it is very useless as you can only run in very short burst to where it makes me doubt the health conditions of the characters... On a serious note, the running feels more like a quick hop and a skip (and a jump... Yep, that's a My Little Pony reference). The controls also have a sluggish feeling but it actually adds to the effect to the game, like you are scared and treading with caution. Graphics in this game look average but the darkness in this game covers a lot of that up but when you come close with items, you will notice the lack of detailing. You won't be mad at the graphic details as you won't be thinking about the graphics at all as you'll be too distracted with the events to do so. 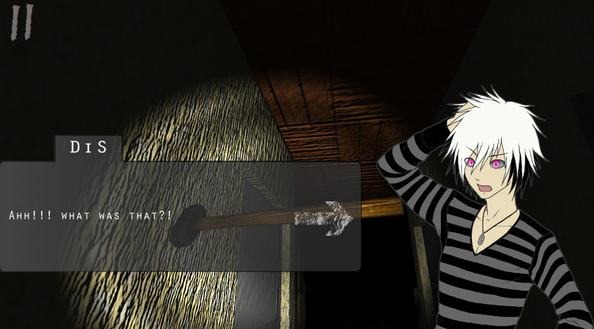 This game also uses manga/anime styled 2D graphics for the main characters and I liked them as they had a B-grade horror movie charm to them. Music in this game is very atmospheric and goes with the dark themes but it also sounds very muddy and I do not know if that was bad encoding or to add to the horror effect. The voice acting in this game is not good as the sound quality was very rough and the acting itself sounded like it was done using digital voice software. The acting did get laughable as well during the scenes where the characters screamed as it sounded forced and un-genuine. Overall this game played fine but this game is story heavy and the story in this game wasn't good and even worse when it comes to the horror. Even if this game is cheap, I am not going to recommend this game as it isn't worth your time unless you are really into collecting Steam Trading Cards. Not recommended.